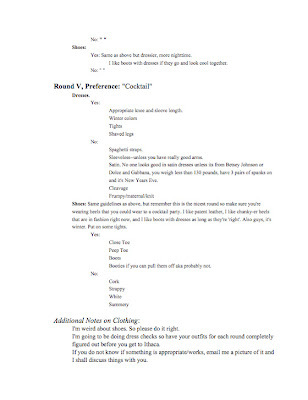 OOH FANCY THAT: .. gross, this is really lame ..
.. gross, this is really lame ..
Fashionista posted the pledge week dress code policy from the Pi Phi Cornell chapter, and it's f-ed up. The chick that wrote this is just terrible, but please read on for your amusement. Apparently, she wants to murder all plastic accessories, is the sole gatekeeper of time, and cannot even stand to look at satin. I only posted an excerpt (click to enlarge), but read the rest here!